1. How many people will be in my class? 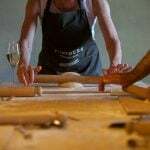 We only take small groups on our cooking holidays with the maximum of 10 people per class. 2. What type of food will we be cooking? You’ll learn new techniques and skills, while creating recipes traditional to the region using fresh, seasonal ingredients. Dishes you will sample will be different from location to location. Whilst the dishes will vary, one thing is guaranteed: the food will be local and authentic to the Italian culture. To find out more about the dishes you will prepare on your cooking holiday, check our recipe site. 3. How long are the lessons and how are they structured? Your lessons will range between two and three hours and take place each day. They include the preparation of a starter, main and dessert and with a true passion for cooking, our local chefs will ensure that you’ll get the most out off each and every class. Just like the Italian cuisine, we make sure that the recipes you’ll learn are tasty but simple. This way, it will be easy for you to recreate the dishes once you are back home.